Hello, and welcome back to this blog series about pairing alcohol and food together in a way that will delight your taste buds! You know the meal is good when you start to get sad as you can start to see the bottom of the plate and the glass. 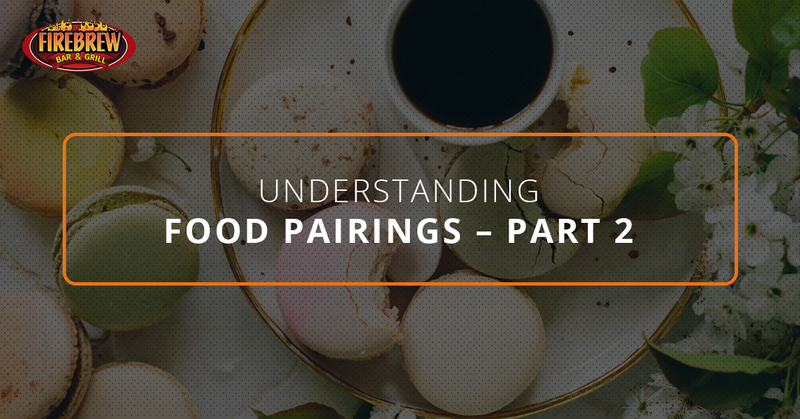 With that in mind, we decided to share some of the best food pairings that we’ve found. At FIREBREW Bar & Grill, your favorite family Virginia Beach Restaurant, we know how important proper pairing can be to making the meal of your dreams. In fact, the right drink can make your meal remarkably memorable afterward and add to the satisfaction you feel. When eating dessert and you have the choice to combine ice cream, chocolate syrup, and caramel syrup, you do it because these foods all taste great together. But when it comes to alcohol and a meal, it’s much harder to know what goes together. That’s why we are here to help you know where to start when you are ready to give pairing a try. Read on to learn about some of our favorite classic pairings. In our last blog post, we suggested that you pair your white wine with seafood dishes, as the light flavors of both complement each other. But what happens when your food is more robust in flavor? Red wine always packs a strong flavor that works great with foods that also have bold tastes. That’s why we love pairing red wine with red meats like beef, steak, and roast lamb. Regardless of whether you prefer dry reds or ones with a little bit more sweetness to them, they are sure to complement the dish you order. Order one of our steaks when you stop in and grab a glass of red wine from our self-service wine bar! Also, red wine is a great complement to cheese. Keep this in mind as you order from our selection of pizzas! Like pairing your food with your wine, you should also attempt to match the strength of your dish with the strength of your beer. But keep in mind, you still want the elements to balance. If your dish is a little bit sweeter (like barbeque food), then feel free to gravitate towards a beer with a little more bitterness to it. We also love to pair beer with salty foods. It tends to really bring out the flavor of the beer! Come to FIREBREW Bar & Grill! At FIREBREW, we always want to provide the top restaurant experience for you and your family. Stop in tonight for date night or bring your friends! We encourage you all to try all of the delicious beers we have on tap. If beer isn’t your favorite, we recommend giving our self-service wine bar a try. With the choice to choose your wine type and your glass size, you can have your wine the way you want it. If you are ready for an incredible dining experience, come and see us tonight!